Home » Youth Tennis News » 10 and Under Tennis » Do You Know The Benefits Of Blended Lines? Do You Know The Benefits Of Blended Lines? Megan Broccolo, the Southern California Tennis Association’s Red, Orange, Green (ROG) Ball Development Coordinator, pointed out, “The opportunities and possibilities are endless when it comes to Red, Orange, Green Ball tennis. Having beginners play on smaller courts with smaller equipment allows them to have fun, learn at their own pace, develop proper technique, understand ball control and have greater court coverage. Many coaches at facilities and clubs in Southern California are teaching ROG and have seen significant changes in the way players are developing their games. They are seeing increased participation in their junior programs, since ROG helps beginners enjoy the game on smaller courts, and they are also seeing players sustain rallies and learn better court tactics. 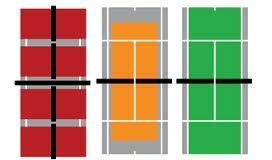 “Since beginners are playing on smaller courts, it is beneficial to have permanent blended lines to mark the playing area, whether they are 36 foot courts (Red Ball) or 60 foot courts (Orange Ball). Having blended lines means it is no longer necessary to install temporary tape, or throw down lines on court with chalk. Not only do blended lines make learning tennis more accessible and less intimidating, but it also makes it extremely convenient to hop on/hop off the court, so on-court time is maximized. Then, there will be no worry about players kicking the throw down lines out of place or ripping the tape as they run around on court. Blended lines make the experience much more enjoyable for players and teaching pros. Next PostUSTA Logos Get A Facelift!